It was during the height of the Cold War, that the US Air Force felt the need for a fighter aircraft which would have a ridiculous level superiority over its adversaries on the other side of the Iron Curtain. They realized that the latest Soviet fighters were on par with the latest American fighters, and any future conflict would be fought on an equal footing. They wanted to avoid this situation and have a clear and broad advantage in every conflict, before it even started. The current 4th generation fighters did not boast of any revolutionary new technology. So its successor, a 5th generation fighter would feature cutting edge technology and several features which were unheard of in fighter aircraft. This article will take you on a journey through the origins, development and production of the F-22A Raptor, which has captured the hearts of millions of aviation enthusiasts around the world. It all started in 1981 when the USAF felt that the newly inducted F-15 needed replacement with something way more powerful than it. They believed that the F-15/16 would be obsolete by the beginning of the 21st century. So, in June 1981, they issued an official Request for Information (RFI) for the next generation Advanced Tactical Fighter (ATF). It would be a generation ahead of the F-15 and have features which were absent or rare in the fighters of that era. The requirement of the ATF was tailor-made to give the USAF, an unmatched fighter jet which would be better than the Su-27 and MiG-29. They wanted their new fighter to be ‘invisible’ to enemy radar until it was too late for the adversary to react. By 1984, the final requirements of the ATF were announced, and they are as follows. The USAF wasn’t new to stealth technology having operated the F-117 already. But this was the first time in aviation history that an operational stealth fighter was going to be built. The main contenders for the ATF program were Northrop and Lockheed, who had a vast amount of experience in designing and building advanced aircraft. However, this was a multi-billion $ program and a single company couldn’t afford to invest that much money for a project in which one design would be rejected. Hence they partnered with other major aviation firms in order to share the workload and funding. There were 2 consortiums eventually formed. The Lockheed led team had Boeing and General Dynamics while the Northrop led team had McDonnell Douglas as their partner. Since all these companies had a vast amount of experience and top notch facilities, they had no trouble in designing and building a stealth fighter. The official USAF requirement at that time was 750 such fighters. 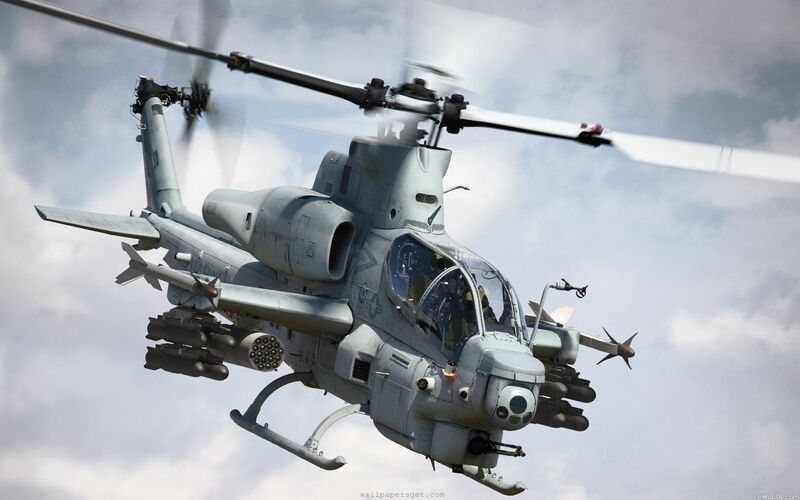 The US Navy showed interest in a naval variant of the ATF and expressed their desire to procure 546 such high-performance aircraft for their carrier fleet. This was designated as the Naval Advanced Tactical Fighter and would replace their fleet of F-14 Tomcats. Lockheed developed the YF-22 as their prototype. 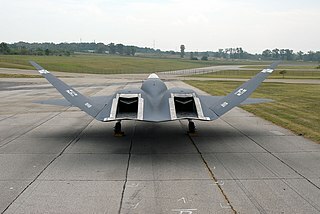 They went for a conventional approach for the wing and tail layout which was initially based on their F-117, but the design was later tweaked to what it looks like today. This 5th gen aircraft had a conventional layout of wings and tail fins with suitable modifications to reduce radar reflectivity of these surfaces. The YF-22 was an aircraft built for maneuverability and stealth and was designed to trounce the supermanoeuverable Flankers in a dogfight. Northrop developed the YF-23 as their prototype. This aircraft used a very futuristic design which made it look as outlandish as the SR-71 Blackbird. 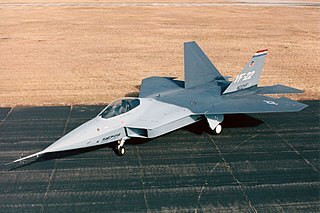 The YF-23 was optimized for high speed and was the stealthier than the YF-22. It had diamond shaped wings and a V-shaped stabilator (fully moving stabilizer). It featured fixed engine nozzles instead of thrust vectoring ones like on the YF-22, which reduced its maneuverability compared to its rival. 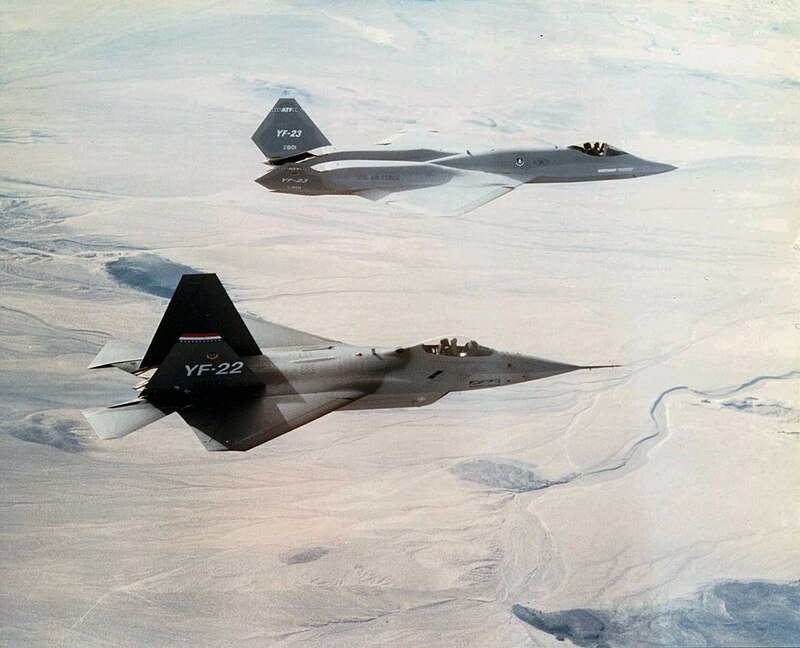 The two aircraft were subject to rigorous testing where Lockheed ensured that the YF-22 exceeded the performance requirements for prototype aircraft and even fired AIM-9 and AIM-120 AAMs. Finally on 23rd April 1991, the YF-22 was declared the winner, and the USAF selected the Pratt & Whitney YF-119 engine to power it. It was one of the earliest aircraft to have a full glass cockpit, where large LCD displays replaced conventional dials and gauges. This, combined with sensor fusion, made the F-22 a very pilot-friendly aircraft which eliminated the need for a navigator. 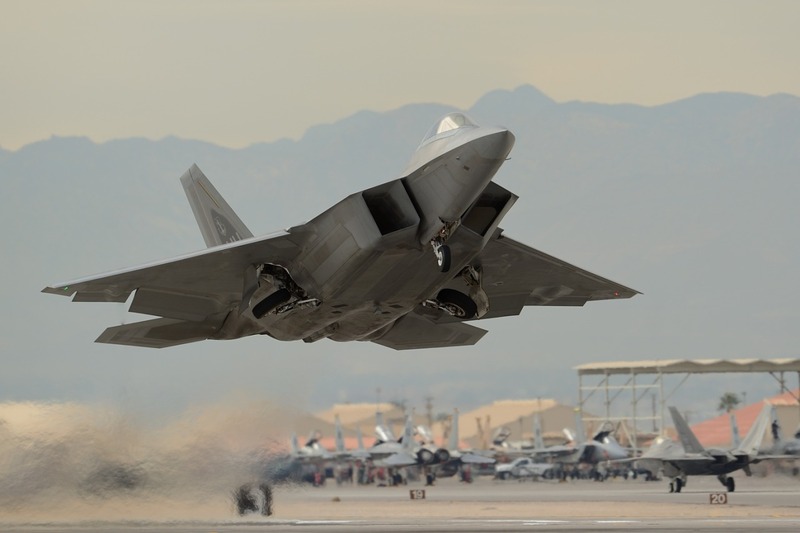 The F-22 structure is made of high strength materials like Titanium alloys and composites, which enables it to withstand the heat and stress of sustained supersonic flight. The airframe is coated with special radar absorbent materials which absorb radio waves. This, along with the shaping of the airframe, gives the Raptor its stealth characteristics. The heart of any aircraft is its engine and the Pratt & Whitney F-119 PW-100 turbofan engine powers the Raptor. It features 2 such turbofans which individually produce around 120 kN of dry thrust and >160 kN of afterburning thrust. This exceptional level of thrust, combined with its aerodynamic design, allows the F-22 to supercruise at Mach 1.7. Supercruise is the capability of an aircraft to fly at supersonic speeds by using the engine’s dry thrust only. 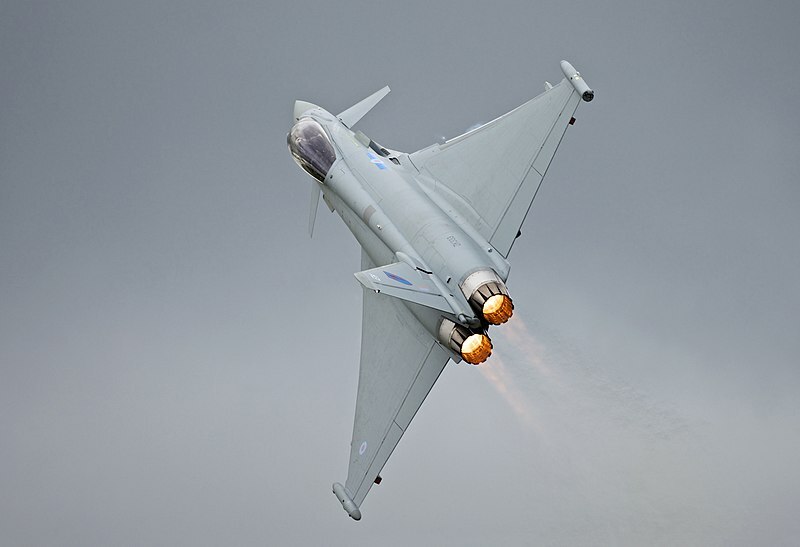 Afterburning thrust is needed for other aircrafts to fly at supersonic speeds for short intervals. But the F-22 can fly at supersonic speeds for long periods as it doesn’t need to use fuel draining afterburners. The engines feature two-dimensional thrust vectoring nozzles with ±20°up and down movement for improved aircraft agility. This helps the F-22 to make extremely tight turns and stand toe to toe with those supermanoeuverable flankers. The engine is built for ease of maintenance and features 40% fewer parts when compared to engines of 4th gen fighters. Also its thrust is greater than any 4th gen fighter jet engine in service. The photos below show the thrust vectoring nozzles in action under laboratory conditions. 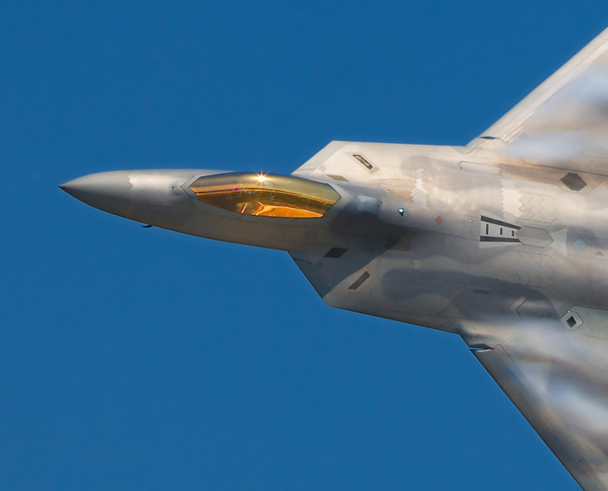 The original F-22 requirements called for a lot of sensors like Infrared Search and Track (IRST), Side Looking Radar (SLR) arrays, Active Electronically Scanning Array (AESA) radars to be integrated onto the F-22. But the SLRs were deemed to be unnecessary and expensive and removed, although the space allotted for it was left empty in case the USAF changed its mind in the future. The IRST sensor ball would protrude from the nose of the F-22 and compromise its stealth features as it reflected a lot of radio waves. The requirement for a tiny RCS of less than 0.00001 m² led to the omission of the IRST pod as well, but again there’s space left over for future implementation. This shows that the F-22 has a lot of upgrade potential and can be fitted with additional sensors if the need arises. Currently, the main radar is the nose mounted APG-77 AESA. At the time of entering service, it was the most advanced radar in the world to equip a fighter and it is currently surpassed by advanced variants fitted on the E/A-18. The APG-77 is said to have a range of about 250 km which enables it to detect its adversaries long before they even know what’s happening. It can also provide fire control for the AIM-120 which would allow it to shoot down a hostile aircraft 100 km away, without the F-22 even revealing itself to enemy radar. This radar can also act as a jammer by overloading sensors of hostile aircraft and missiles. The APG-77 will be upgraded to enhance its detection range to 400 km using narrow beams. One of the most vital but rather unknown sensors are the AN/ALR-94 radar warning receiver (RWR) and the AN/AAR-56 Infrared and Ultraviolet Missile Launch Detector (MLD). 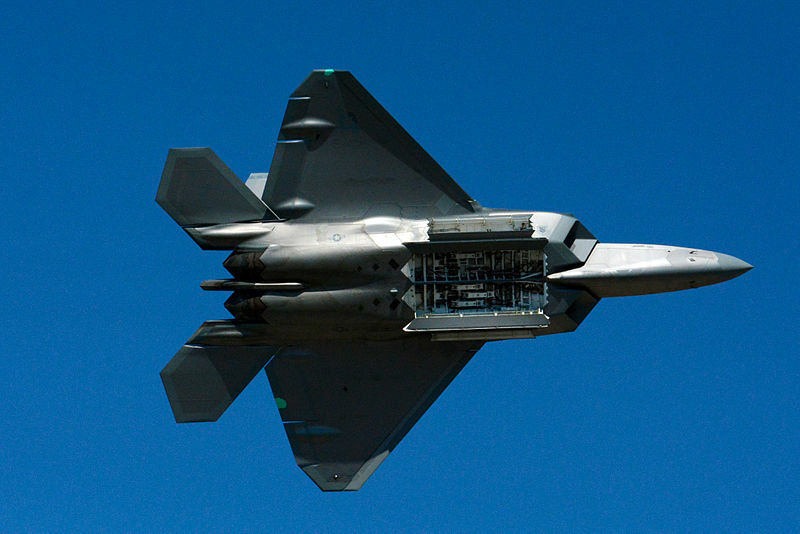 The RWR, which is distributed around the aircraft, is a passive radar detector which enables the F-22 to detect hostile radar emissions without revealing itself. It has a range of over “432 km”, which means an F-22 can detect an enemy aircraft’s radar over 400 km away! That’s before the enemy aircraft even appears on the Raptor’s radar screen. In actual combat, the RWR detects hostile missiles heading towards the Raptor and acts in conjunction with the MLD and the Countermeasure Dispensing System (CMDS) to release Chaff and Flares to evade enemy missiles. A 5th gen fighter needs 5th gen missiles. But unfortunately it still uses the same missiles used by older 4th gen aircraft. Although this won’t affect combat performance much, it still makes the missiles jammable by enemy radar. Also, the relatively larger size and diameter of these missiles coupled with non-folding fins, limits the total amount of missiles carried internally to 8. In a typical air combat configuration, the F-22 carries 6 AIM-120s in its fuselage weapons bay and 2 AIM-9s in its side bays. This could possibly be increased to 10-12 missiles in the future, by using compact missiles with small diameters and folding fins. The current capacity of 8 is enough for combat against any modern 4th gen fighter. The weapons suite is being upgraded and the F-22 will be able to field the newer AIM-120D and AIM-9X after the upgrades. The F-22 is technically designated as the F/A-22 because it is a multi-role aircraft which can fight and attack ground targets as well. 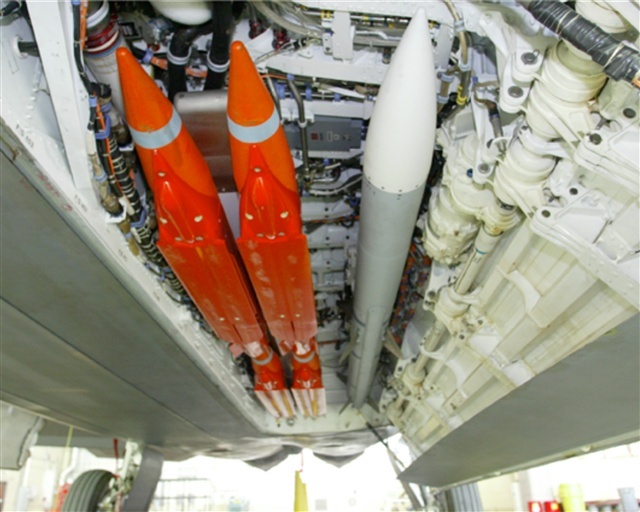 The weapon of choice for the F-22 to take out ground targets is currently the Small Diameter Bomb (SDB). Up to 8 of these GPS guided, 50 km range, winged SDBs can be carried in the central weapons bay along with AAMs. They are used for precision strikes against enemy ground threats and their small size, accuracy and effectiveness makes the Raptor a potent strike aircraft. The larger 1000, 2000 lb. GPS guided Joint Direct Attack Munitions (JDAM) can be carried, but in very small quantities of 1 or 2. Since the USAF has stealth bombers in its inventory, it’s unlikely that the F-22 will be used for any serious strike missions. Its role will be limited to achieving and maintaining air-supremacy over hostile battlefields. The weapons carried by the Raptor aren’t limited to its internal bays, but can be carried externally as well. 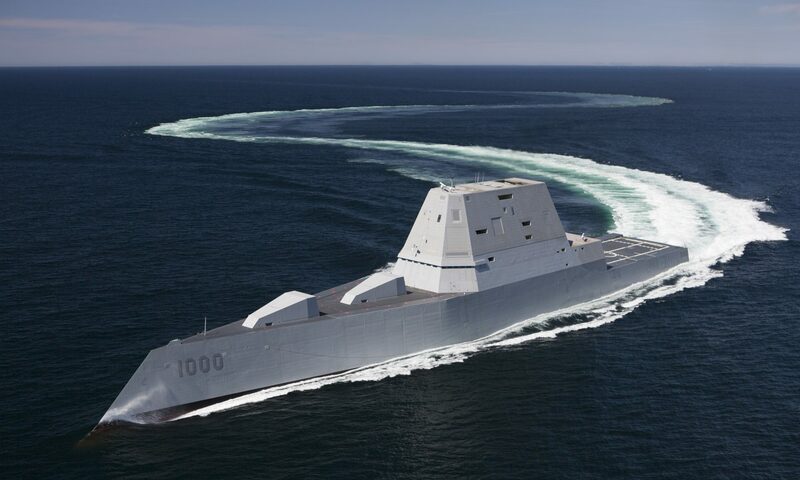 This is generally used when stealth is not needed and a better weapons load + external fuel tanks would be more beneficial, such as over friendly or neutralized territory, or when the enemy has no anti-air or aerial assets which would make stealth unnecessary. 4 AAMs or 2 external fuel tanks can be carried under the wings. These external stores can be jettisoned along with their mounting pylons mid-air, if the need arises or stealth is suddenly required. The high speed of the F-22 and its supercruise ability allows weapons release at very high speeds, which in turn extends the range of existing missiles due to a high launch velocity. The higher the level of technology used in an aircraft, the higher the level of the problem which affects it. The solution for such advanced problems and bugs is very expensive and generally involves years of testing and research. Though it is the best fighter ever built, it has had its fair share of problems. The most infamous one is the ‘Raptor Cough’, caused by what they say is a faulty oxygen generating system and filter. This left the F-22 pilots with severe cases of cough. The problem is said to have been rectified by installing imported filters and oxygen generators. Money is another problem over here. Being a hi-tech beast, every sortie of the Raptor drains money at supersonic speeds. As of 2013, the cost per flight hour was $68,362, which is over 3 times that of the F-16. The stealth coatings of the F-22 are maintenance intensive and each and every major component has an astronomical price tag when compared to 4th gen fighters. Although the US has fought many wars since the time the raptor entered service, it hasn’t seen any actual combat. Till recently, it only participated in military exercises with friendly nations which gave the Raptor pilots much needed experience against 4th gen fighters. 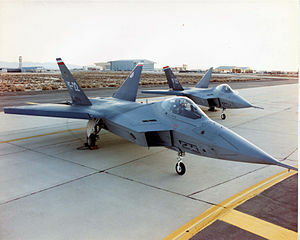 It is said to have achieved lopsided kill ratios in mock combat against USAF aggressor fighters, with 1 F-22 defeating multiple adversaries with ease. It practiced extensively against every modern US fighter as its main purpose was to achieve air supremacy over the battlefield in case of a war. However in September 2014, it made its combat debut over Syria for a very different mission. After being refueled by a KC-10 on its way, it bombed IS targets and made its way back to base. There are questions raised as to why the USAF deployed such an advanced fighter to attack a relatively undefended airspace. But some say that it was because the Air Force didnt want to take a chance against any undetected threats which could shoot down 4th gen fighters. There is also the possibility that it was a well organized publicity stunt for the F-22, which has been facing strong criticism for having never been used in combat, despite spending 65 billion $ on the program. The F-22 also participates frequently in Combat Air Patrol missions, but most of the countries will be unaware of it because they can seldom detect it. 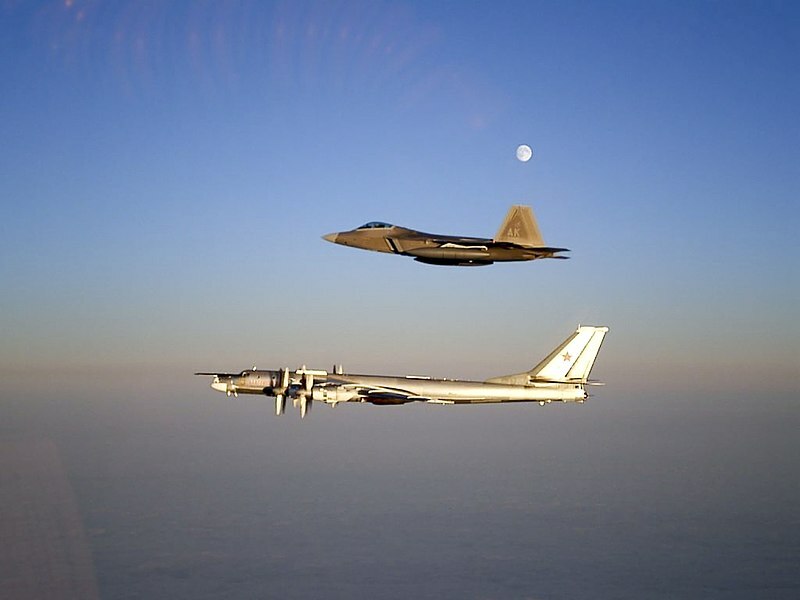 The F-22 also does the traditional job of intercepting and escorting Russian Tu-95 bombers and recon aircraft near Alaska. There were rumors floating around that the F-22 once saved a USAF drone from an Iranian F-4. It supposedly sneaked up stealthily behind the F-4 and then warned the pilot to back off. To detect the strengths of its adversaries, the F-22 is frequently deployed in combat exercises with friendly nations which possess the latest Russian fighters. Recently the Raptors carried out mock combat against Su-30MKMs of the Royal Malaysian Air Force. An F-22 intercepting and escorting A Tu-95D. Note the external fuel tanks on the Raptor. When you create a fighter jet that you say is invincible, everyone will start finding ways to prove you wrong and try to create something better than your product. Russia, Europe and China have designed advanced fighter jets which can give the F-22, a run for its money. In an exercise, Eurofighter Typhoons of the RAF claim to have detected the F-22 at considerably long ranges using their IRST sensors and achieved a simulated ‘kill’. 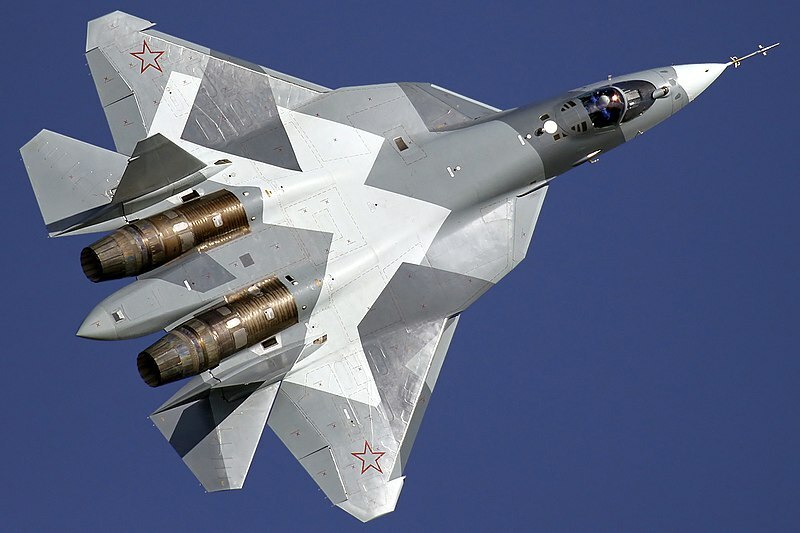 Russia says that their latest Flankers can out-manoeuver the Raptor and carry more missiles than it. But there is a small fact. You can’t shoot down something which you can’t see. This was the basis of the F22 and will remain a fact for decades to come. No airborne radar which is currently operational can detect the F-22 at sufficiently far off distances. Even if a fighter manages to detect the Raptor at close ranges or when its weapon bays are open for a second, it will be a nightmare for the adversary to get a missile lock on the F-22. So, any potential Raptor killers must be able to detect the F-22 from 100+ km, remain undetected by the F-22, possess long range missiles which have a range of around 200 km and the ability to track the Raptor and guide the missiles towards it. No operational fighter has this ability. However it’s not wise to underestimate the rivals of the F-22. Although still in prototype testing phase, the Russian Su-50 will be a powerful adversary by the time it enters service around 2017. The Su-50 does not possess the stealth features of the F-22, and according to official figures, the Radar Cross-Section of the Su-50 will be 1000 times that of the F-22. This means that the Raptor will clearly have an advantage in detecting and shooting it down at long ranges. But, the Su-50 will have L-band radars which can detect stealth aircraft at long ranges, so won’t it detect the F-22 from afar? The answer is most likely no. These radars would be more effective against the F-35, which has a bigger RCS than the F-22, but definitely not against the Raptor at least at long ranges. The most important aspect of modern aerial combat is electronic warfare. This non-lethal form of warfare can disable advanced fighters without a single shot being fired. The powerful APG-77 radar of the F-22 enables it to jam every other fighter in existence and render them useless in the fight. But this is only done at short ranges and in emergency situations as jamming the enemy would make the F-22 visible on radar. But there are 2 fighters that the F-22 can’t touch electronically. They are the E/A-18 Growler and the Su-50. The Growler has jammed the F-22 in exercises with its powerful built in jamming equipment and APG-79 radar, but isn’t a threat as they are both on the same side. However the biggest electronic thereat is the Su-50 from Russia. Since the Russians know that they can’t compete with the US in stealth technology, they have concentrated in putting a wide variety of radars, sensors and advanced jamming equipment in their 5th gen fighter. The Su-50 will house multiple AESA radars in its nose, L-band wing radars and rear looking AESA radars and jammers. It will also feature the latest Himalaya Electronic Warfare Suite and Jammers which are said to be the most powerful of its kind to be mounted on a fighter. Only constant upgrades can keep the F-22 on top of its adversaries. Now that you know about the F-22 and its capabilities, you may be wondering whether the F-22 production be restarted if needed? The answer is: Theoretically yes, but practically no. Because the new batch would require billions of $ to set up new facilities and the aircraft would end up costing 2-3 times more than the original batch. Also during exercises, it is fitted with a special radar reflector to appear on the radar screens of friendly aircraft. The F-22 will now supplement the F-35, F-15 and F-16 in the USAF until the F-35 replaces the 4th gen aircraft. The F-22 was designed with a service life of 30 years, and will need to be replaced 2030 onwards. The replacement will be a 6th gen fighter which will have unprecedented capabilities and the research work on it is said to have already started. If you enjoyed reading this article, do rate it below. 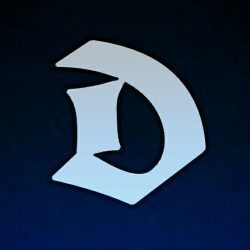 Share your opinions and feedback in the comments section. Nice article. Although points to consider. The low production has left it vulnerable to loses. The enemy goes after it on the ground with SF before the conflict begins. Being able to generate loses in such a manner renders the F-22 very vulnerable. Also the failure to upgrade the avionics and sensors is causing problems. Failure to provide a Helmet Mounted Cueing Sight leaves the F-22 weak WVR is such a case. Also failure to develop a BVR missile for it such as the Metor fails to capitalize on the F-22 strenghts. Ultimately we have a great fighter whose effectiveness has been lessened by a failure to produce in sufficient numbers. Coupled with a further weakening by a lack of development to grow its potential and also keep it ahead of potential threats. Great article, nice read. One other point you missed out when comparing the F22 vs T50 is the fact that it only carries 1 AIM120 in its stealth config. So even if the raptor gets hold of a T50 before it detects it. It still only has 1 chance at killing it. On the other hand, as soon the bays open for the missle, T50’s L-band radars(considering it can) will isolate its F22 and will start engaging it while electronically countering the AIM fired at it. 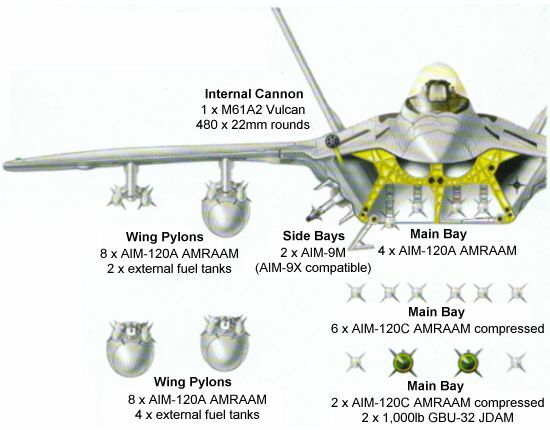 So the limited armament inside the bays is effectively killing the BVR advantage the F22 holds(considering it does). F-22 can carry 6 AIM-120 in stealth configuration. i would love to see such an analysis upon the Su-30 MKI in detail soon . Thank you for writing this article. I just want to point out that you misspelled Royal Malasian Air Force and it should be Royal Malaysian Air Force. That’s all and thank you again. Thank you. I have made the correction. Could you give your opinion about 2012 Red Flag Exercise, when German Typhoon scored several F-22 kills. In this regard, more within visual range (wvr) capabilities would be more discussed than beyond visual range (bvr). Concerning the Typhoon´s encounter with F22´s: It was specifically pointed out, that the EF was indeed able to get a RADAR lock on the F22 over a significant distance. There are rumors of a lock on 80km, so… Besides that: As the British also demonstrated, advanced self-protection suits (Praetorian etc.) are a reliable tool to intercept and trace back the radar emissions even of LPI systems. And, as you already pointed out, IRST can be used as an alternative over medium ranges, too. 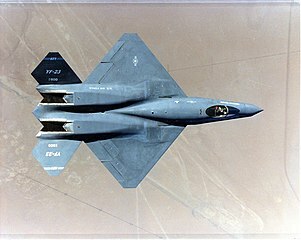 Therefore, just passively, it might be true that the F22 holds an edge over every other fighter. But practically, that is not certain. And since, depending on distance and conditions, even powerful AWACS radars remain prone to jamming techniques, their support is everything but save aswell (especially due to the development of missiles like the MBDA Meteor, among others). As Dennis said and I agree there are many ways to lock a stealth aircraft even if you have to use IRST which is what a lot of modern aircraft, the Eurofighter especially would rely on if up against steallth aircraft. 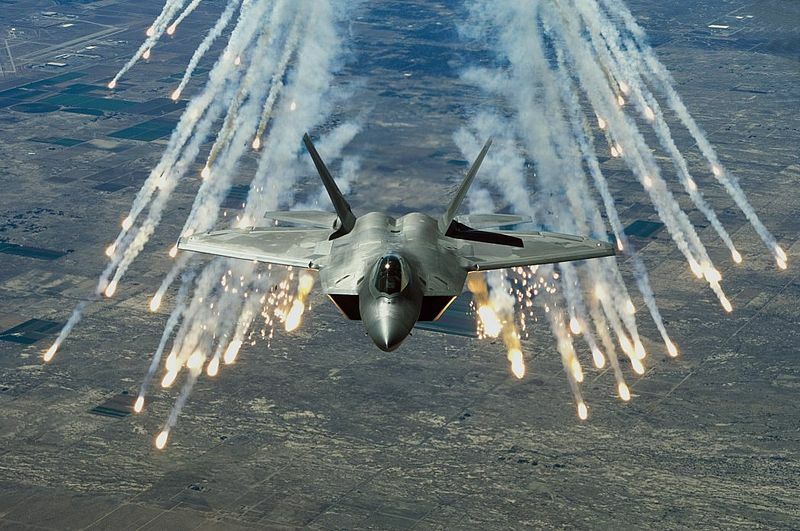 The biggest weaknesses to the F-22 is obviously built around the premise it cannot be seen. It sacrifices cost, load out among other things for the sake of older systems not being able to see it but the truth is, stealth does not make you truly invisible. It reduces the range you can be detected but considering ever larger and more efficient radars are being developed which can track in different bands (stealth is not effective against all bands) this advantage is just a money sink and not a true advantage at all. In the future the Eurofighters are getting MBDA Meteor, a superior AESA (not fixed plate but with wider track range) in CAPTOR-E and has more multi-role capabilities since it is not worried about what it places on its pylons. This combined will allow it to detect with superior capability and strike harder by far than the Raptor which is unfortunately stuck with old missile technology like the AMRAAM and sidewinder. There is no point in having a stealth option when your short range (relatively) missles require you to get close to a target, and even when fired (and the bay opens and the heat from the missile lights it up) you have only a small chance (kill ratios for AMRAAM are low, and get lower in cold air/high altitudes) to hit. This is without including jamming, ECM, countermeasures and decoys. like those the effective Eurofighter DASS suite can supply. Now, if the Raptors can get HMS (helmet mounted sights if they do not have them yet) and better hobs missiles like ASRAAM they would be more effective in WVR which could allow them to circumvent the weakness of their longer range missiles since I do not think they will buy Meteor. Su-50 and J-20 has advanced IRST sensors, DFRM jammers and multisensory BVR missiles. izdeliye 180 K-77M and PL-15 has L band AESA seeker. 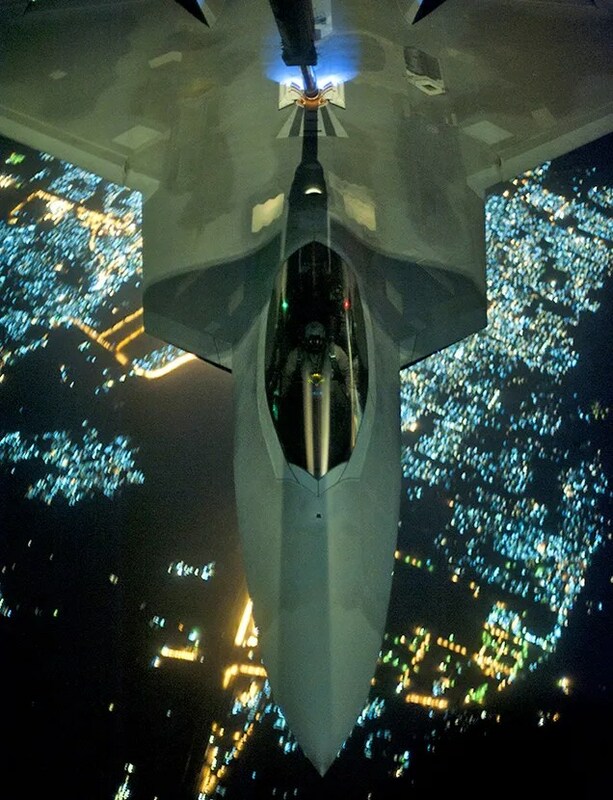 Now look at F-22, which has no IRST, no helmet mounted sights, no jamming effective against L band within 100KM, and AMRAAM that can be defeated with DRFM jamming. Lets say 1 out of 3 missile fail to hit. The field is quite even. SU-50 is more maneuverable, J-20 can carry more BVR missile, and F-22 is more stealthy. F-22 has obsolete weapon system and Russian and Chinese has the latest BVR missiles. F-22 has 187, the Russian and Chinese will produce more than 200 throughout the next decades. 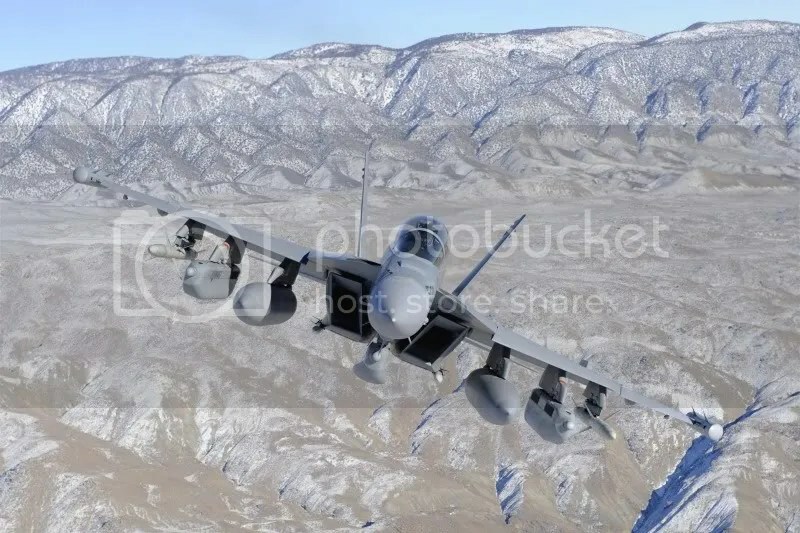 In the next decade will have our fX program up and running in which will exceed the PAK Fa and j20 not to mention the f35 is updated with new technology that certainly can handle those planes, also the raptor had its upgrades now too .. it’s a moot point your making .. fact is the Russians and Chinese will always be far and I mean far behind the US ..
How do those nosy TU-90’s end up in Alaska? would be nicer if the US got their noses out of other people business and stopped relying on war production to keeps its economy on track, and who made China and Russia the enemy , The US now the most hated country in the world, all because they continually interfere in matters that have nothing to do with them all in the name of peace but its the dollars that its all about. Thanks for sharing the useful post with us.Great information about Amazing Pw100 engines that you are sharing with us. It Was very helpful to me.